Sen. Garrett Mason, R-Lisbon Falls, puts his hands to his face while listening to arguments during the Senate's hearing on the state budget at the Maine State House in Augusta in this June 30, 2017, file photo. The same divide played in 2018 and on Thursday, when an incensed LePage said legislative leaders wouldn’t advance a governor’s bill aimed at shielding elderly Mainers from municipal foreclosures. Among others, he blamed Senate President Mike Thibodeau, R-Winterport, and said he hoped Senate Republicans get “destroyed” in the November elections if they block it. He then said there was “a high likelihood” that he’d call legislators back into session before the election to deal with that and other priorities. Municipal officials opposed his bill as onerous, and it was unclear if legislative leaders would advance it, but LePage’s statement sent lawmakers scrambling to pass a version of it. Senate Minority Leader Troy Jackson, D-Allagash, spearheaded the one that was approved Thursday evening. 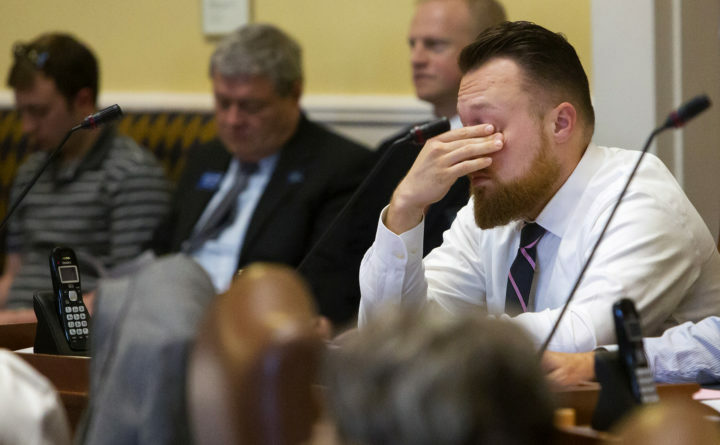 Lawmakers were still at the State House months after statutory adjournment because lawmakers ended their regular 2018 session in a May stalemate after it was supposed to end in April. House Republicans blocked an extension of the regular session, which led to a months-long special session that ended Thursday. That dispute began when House Republicans blocked taxpayer funds for 2018 campaigns by refusing to support a bill fixing a drafting error and persisted after House Democrats held back approval of a compromise bill conforming Maine to the federal income tax system. There wasn’t much to fight about by Thursday. Decisions from a judge and Maine ethics regulators re-opened the Clean Election fund, and the tax conformity measure was swiftly approved last month with bills aimed at reforming the state’s embattled child welfare system. House Republicans upheld the 643rd — and possibly final — veto of LePage’s eight years in office. Governors dating back to 1917 issued only 469 of vetoes in total. On Thursday, 46 Republicans backed LePage in nixing a bill to allocate $334,000 to cover unforeseen costs of the 2018 election that were sprung on lawmakers by Secretary of State Matt Dunlap last month. Dunlap spokeswoman Kristen Muszynski said the additional expenses will be due in November, the office may use money now allocated for long-term contracts to cover them and that it would make a similar request for funds in January to pay bills due then. Correction: An earlier version of this story made an incorrect reference to Assistant House Minority Leader Ellie Espling, R-New Gloucester. She backed an original version of Gov. Paul LePage’s bill aimed at shielding seniors from municipal foreclosures, not a subsequent version that passed the Legislature.